Many of us use Google everyday, for homework for research or just to find some information. What if you can use Google to make money as well? IPhones may not come cheap, but how does it sound if you could make Apple buy you a brand new iPhone? Yes, by investing in those shares, you can make those companies work for you. Furthermore, all of these are also available in a real time stock trading simulator as well, in case you lack the confidence to risk your money on real investments. 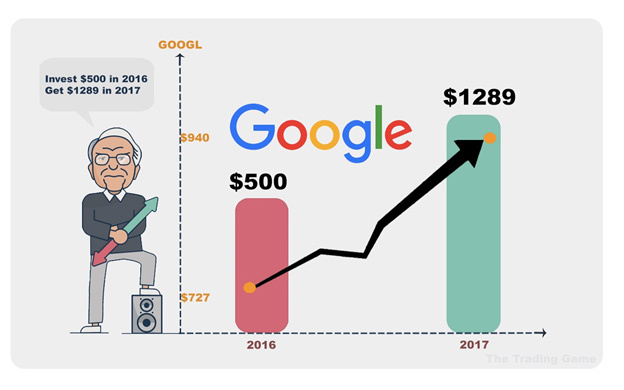 Alphabet Inc or Google stock has risen more than 18% to $940 in July this year. This powerhouse has assisted S&P 500 to double their returns this year as well. However at present, Alphabet is suing Uber for stealing trade secrets and also tussling with the European Union regarding many antitrust cases. Hence, is Alphabet still go to stock or should it be avoided? Alphabet stock is a value stock which has a value-to-free cash flow of 20.25 which is lower than Amazon at 47.72, Facebook at 31.53 and Alibaba Group Holding Ltd at 30.50 but higher than Microsoft at 17.48 and Apple at 14.79. Alphabet has a very firm financial foundation with $7billion generated in cash flow every quarter. On March 2017, Alphabet held $92.46 billion in cash and investments while only having $3.94 billion in debt. Besides this, the firm also reinvested $109.42 billion in profits over the years. It has low bankruptcy risk which is measured by its high Altman Z-score. With their favourable financial position, Alphabet will find it easy to gather stakes in other tech companies when they fall into depression. The many side projects Google is venturing into. This makes the stock something similar to investment in a venture capital firm. Some of those projects are Waymo (the self-driving car project), Verily Life Sciences who owns Deepmind and Project Loon(high speed internet services). There is a lot of growth potential for Google and it will definitely not stop here. Alphabet stock relies too heavily on ad revenue which makes up 86.5% of their total revenue. It is a highly risky line of business as existing business models can easily be insignificant within months. The stock can easily crash head first if their advertising does not hit up to standards. In this fast paced industry, many competitors can easily have a slice of the big cake. In cloud computing, big names such as Azure, IBM and Alicloud all threatens the survivability of the players here. Going to self-driving car technology, powerhouses such as Uber and Tesla all have a big stake in the market. With so many giants waiting to pounce on every opportunity, keeping up definitely isn’t easy. Three strikes and you are out? Google is currently undergoing 3 antitrust cases with the European Union but they aren’t exactly out. These cases could leave a huge blow in Google’s profits with fines possibly hitting as high as $1billion. Alphabet isn’t looking too good right now and piling up on their stock isn’t advisable. However, for long term investing, the prospect for Alphabet seems reasonable. But then again, the price of the stock is rather expensive and not tempting enough to hop on while looking at the price / earning ratio. Apple is 50% more expensive with a 30% increase in this current year alone. Nono, those for keeping the doctor away are still as cheap but what we are talking about is Apple shares. A huge part of the success is owing to the launch of the iPhone 8 which received positive expectations. However, Apple has its hands full with supply chains issues and tax reform. Should we just stick to those juicy, crunchy ones at the market instead? Apple’s cash hoard now skylines at $250billion with most of it overseas. This chunk of sitting gold could be well on its way to be freed due to tax reforms. With this much of spare change waiting to be ultilised, investors will be dreaming as much as they can hoping for some juicy returns. Qualcomm Inc, one of Apple’s partner, has locked horns with Apple and is even having a series of lawsuits against them. Apple is currently withholding payments and is seemingly winning the battle. Although this could go either direction, Apple has the upper hand as of now. 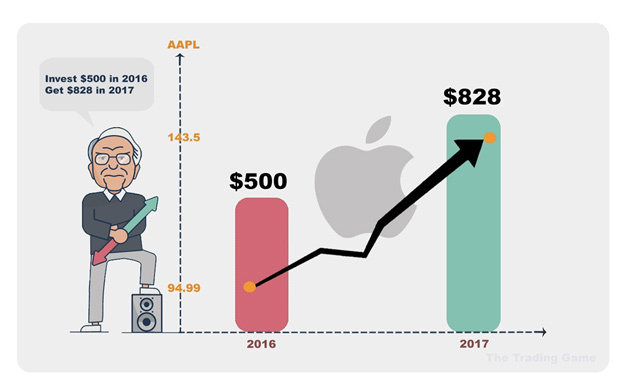 Apple is cheap according to market standards and has improved to a 17.5x earnings as compared to 10-12.5x in the past years. Apple is also cheaper as compared to other tech companies and also provides a good dividend to investors. Supply problems means customer dissatisfaction which in turn lower sales and this will cause many other problems for Apple. Shortages in OLED screen supply will prove a huge obstacle for Apple to meet demand. Analyst Rod Hall from JPMorgan Chase & Co. has already cut down sales estimate in the 4th quarter by 7million. Bank of America-Merrill Lynch is even more negative on this issue with an expected cut of 11 million. Deutsche Bank suggested that the iPhone upgrade super cycle will not occur and raised their expected stock price to $132 which is still a slide from the current levels of $150. With the production problems that is expected to come, pricing problems arises as well. The high-end 8s might cost $1200 and this could greatly dent the accounts of many IOS lovers. Overall, the cons outweigh the pros heavily. Looking way ahead into the future, Apple will need to pull off something stunning rather than releasing new iPhone models that isn’t exactly a needed upgrade from the previous version. With the supply chain problems as well, things could get ugly for Apple in the next few quarters. Over the 300 mark and climbing for 400. Tesla is riding the wave of positiveness with analyst upgrades and market enthusiasm. However, things still look more toward the bearish side than bullish side for Tesla. We look into more detail into why the stock is behaving as such. In June 2017, Tesla had announced its plans to build a plant in China. Once everything is ready to be carried out and the plant eventually smack itself right in China, it will definitely boost Tesla’s competitiveness there. Currently, China charges a 25% tax on imported vehicles which makes it more costly than in the US. With the plant in play, it will be a whole new game for Tesla. Avoiding the tax will give Tesla more cards in hand to play with. Analyst remains positive for the future of Tesla. Berenberg’s analyst Alexandra Haissl has leaped his target share price to $464. He also says that Tesla aims to maximise long term profits rather than short term, risky but with huge returns. Tesla stock has repeatedly broken its highs but investors are too quick to throw in the tower and end up not maximising their profit. With this trend going on, Tesla could be well on its way to crossing $400 and more. Six months after the release of Autopilot 2.0, it is still unsure whether the new version is on par with the older version. The National Transportation Board has also reported a fatality from a crash the previous year. In the end, the report did not settle on a good note. Adding on, Tesla’s head of software left them soon after and even said that Tesla isn’t for him after all. This statement raised many questions about the development for the Autopilot system. With crude oil falling more than $10 a barrel, this in turn led to gas prices falling as well. Gas has slumped more than 25 cents and this will strongly support auto buyers to go for gas powered vehicles instead. In Denmark, the government previously exempted electric vehicles from a punishing auto import tax. Just last year, due to the rule change, Tesla sales in that country plunged from 2,738 vehicles to just 176. If subsidies begin to be reduced or eliminated in more countries, Tesla might not even be selling vehicles anymore. Tesla stock remains strong as of now and it is better to get those short-term profit instead or looking into the future. Wait for Tesla to break more highs.